For my third give-away, you could win a copy of Knit and Crochet toys magazine! I contributed two patterns to this special issue, and in addition to those, there are over 20 adorable and fun patterns to knit or crochet. You can check out the magazine here, and see all the patterns over on Ravlery. As before, if you'd like a chance to win this gift, please leave a comment on this post, including a contact method (email, Ravelry name, etc). P.S. I didn't mention on the previous post that I'm willing to ship to just about anywhere. If for some reason you win, but I can't ship to your country, I hope we can figure out an alternative prize. Posted by Barbara Prime at 12:44 p.m.
Another great prize! Count me in! November 4, 2016 at 1:02 p.m.
Would enjoy having this in my collection! November 4, 2016 at 1:06 p.m.
How cool to be featured in the magazine. Ravelry name: Savitar. November 4, 2016 at 1:08 p.m.
Great giveaway ! Thank you. November 4, 2016 at 1:26 p.m.
Oh, those toys are just adorable. This is a lovely prize. November 4, 2016 at 1:37 p.m.
November 4, 2016 at 1:41 p.m. I'm sure whoever wins this prize will have a lot of pleasure making the toys. Wish I could afford to buy and ship things like this, but, living on a pension makes it impossible. November 4, 2016 at 6:34 p.m.
To the next ten years. Your talent and generosity are amazing. November 4, 2016 at 6:51 p.m. So adorable! Ravelry ID is Lilpixie124. November 5, 2016 at 6:40 a.m.
November 5, 2016 at 8:51 a.m.
Wow, so many cuties! I'm Gloriane on Ravelry. November 5, 2016 at 8:57 a.m.
November 5, 2016 at 10:53 a.m.
What a great book (magazine)......so many projects to do! Congratulations and thank you for the opportunity! November 5, 2016 at 11:20 a.m.
November 6, 2016 at 3:15 a.m.
A platypus... surely not! Very cute indeed. November 6, 2016 at 5:20 p.m. It is always fun to see your new designs in knitting magazines. November 6, 2016 at 6:53 p.m.
November 6, 2016 at 11:15 p.m.
November 7, 2016 at 12:29 a.m.
Good golly, those mice are adorable! November 7, 2016 at 12:31 a.m.
November 7, 2016 at 9:30 p.m.
Looks like a fun magazine. November 8, 2016 at 1:54 p.m.
All my boring craft magazines are for jumper knitting ..I need to spice my life up with this cute toy knitting because seriously ....cute!!!!!! November 8, 2016 at 4:13 p.m.
November 8, 2016 at 5:40 p.m.
so many cute toys...it's mind boggling! November 9, 2016 at 12:30 a.m. 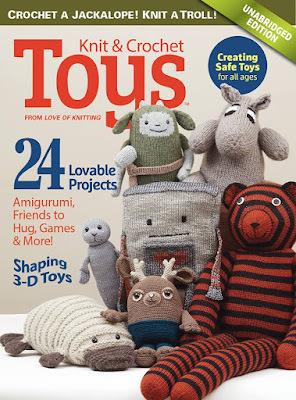 Were I to win this would be my first ever toy pattern magazine. I can be found on Rav as CastOnCalamity. Congrats on your 10 years, and wishes for 10 more +. November 9, 2016 at 6:01 a.m.
My favorite things to knit and crochet have always been amigurumi - this would be awesome to have! Thanks for the opportunity! November 9, 2016 at 9:25 a.m.
November 11, 2016 at 11:51 a.m.
November 11, 2016 at 6:15 p.m.
Oh, even more cute toys! Congrats on being in that crowd! November 13, 2016 at 6:37 a.m. I love this! I'm elemjay on Ravelry. November 13, 2016 at 8:26 a.m.
Congrats on 10 years! I have always loved your designs. November 13, 2016 at 8:41 p.m.